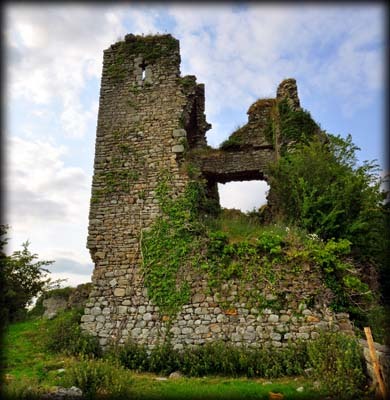 It is hard to believe there is no record of when or by whom Clonmore Castle was actually built. 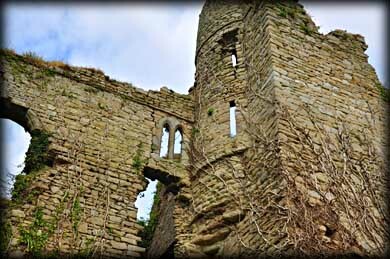 It is typical of a late 13th century Anglo-Norman castle, consisting of a square courtyard surrounded by a curtain wall with four rectangular corner towers. 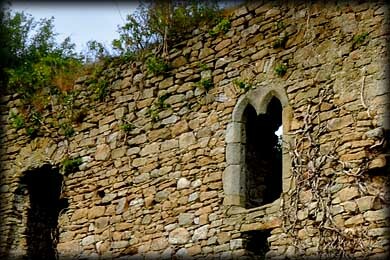 The presence of trefoil pointed lights also indicate 13th century construction. The earliest record of the castle is 1332 when Sir Anthony de Lacy carried out repairs to it. What we see in the top image is quite deceptive, it is actually the eastern side of the castle with the courtyard to the left. The large four story tower is situated in the southeast corner of the courtyard. Running north from the tower is a complex of halls and passages that were part of subsequent restructuring. At the very top of the south wall of the SE tower is an ivy-overgrown gargoyle. From the southeast corner of the ruins we can see the remains of a spiral staircase in the northwest angle. 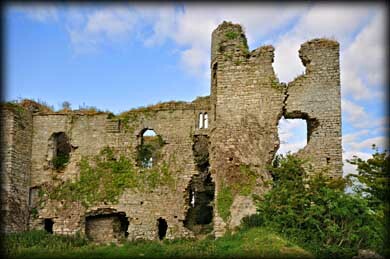 The castle was captured by the Earl of Kildare in 1516 and by the Earl of Ormond in 1598. It changed hands several times the following century before being taken by Cromwell's forces under Colonel Hewson in 1650. Situated: From Hacketstown head south on Slate Row for 5.4 kilometres. As you enter Clonmore keep to your right and drive past the church. The castle is on your right. Discovery Map: 62 S 9602 7618. Last visit Apr 2019.